Lawn care, a continual but rarely enjoyed responsibility of homeownership, becomes much less of a day-to-day hassle for those who install an underground sprinkler system. Lawn care can be especially demanding these days, with wacky weather throwing homeowners around the country for a loop. Long periods with no rain can turn your lush carpet of green into a brown wasteland, while a weeklong downpour can leave your grass looking like an untended swamp marsh. A programmable sprinkler, one that turns on and off automatically at set times, provides a water-efficient way to maintain lawn health. Though not the easiest task, installing an underground sprinkler system yourself means significant savings over the cost of hiring a professional to complete the project. Check with your municipality to see whether any restrictions are in place for residential-use sprinkler systems (one common ordinance stipulates setbacks from neighboring properties). Also, alert your utility companies; they’ll want to mark the locations of all underground lines planned as part of your system. 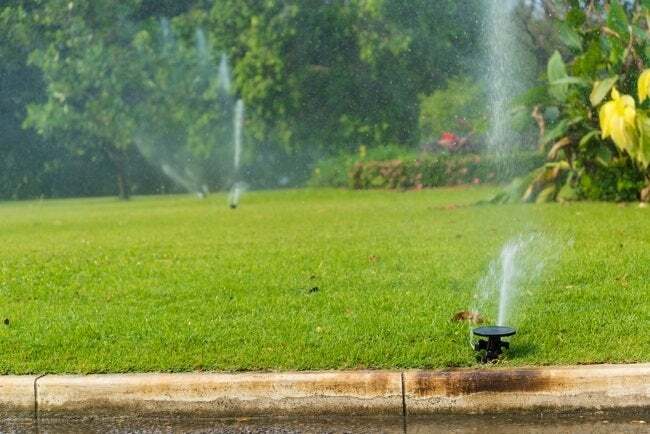 Reputable companies—Toro’s Water Smart Design Service and Rain Bird’s Sprinkler Design Service—offer assistance to ease the frustration of designing a sprinkler system layout. For an effective design, expect to provide a map of your property, along with information about your plumbing (e.g., water pressure). Component parts necessary to purchase include sprinkler heads, tubing, valve pumps, and a system control box. If your climate is warm year-round, PVC pipe may be used throughout your system. Those who live any place where the ground freezes in winter are advised instead to use flexible polyethylene pipe. Cold-climate dwellers must employ special sprinkler heads, which drain when not in use, ensuring that residual water does not freeze and cause the lines to crack. To function, an underground sprinkler system obviously requires water. It’s possible to divert water from your outdoor house bib, but the recommended method is splicing into the water main by means of a T-joint. Hire a plumber for this part of the process if you’re not comfortable tackling it yourself. Installing the T-joint involves turning off the water to your house and situating a backflow preventer valve between the T-joint and sprinkler system input. 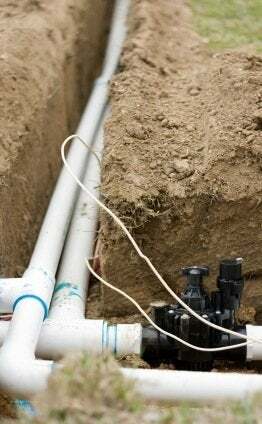 Closely following your planned system layout, dig trenches both for the water lines and the valve box. Rent a trencher from your local home improvement center to make easier and speedier work of this arduous and time-consuming process. Create line trenches that are between six and eight inches deep. If the control box is the brain of an underground sprinkler system, the valve assembly is the heart. Generally, this assembly goes in a central spot from which it channels water via the main line to those lines that stretch into different zones of the yard. Set the manifold box into a hole (with a layer of pea gravel at its bottom) that’s been excavated only deep enough to allow the valve to sit at ground level. After running a line from the water main to the manifold box, begin laying out valve lines to your various sprinkler heads. Where necessary, use T-joints to run pipe from the trajectory of a valve line to the planned location of an individual sprinkler head. Connect every head to a line that reaches the manifold. Place the control box in a sheltered area with an electrical outlet, and run wire underground from the valve manifold to the control box (here, consult the manufacturer’s directions). Accompanying each valve line are two wires: one for the common connection, another for a zone-specific connection. Replace the dirt in all trenches and fill in the holes dug for the sprinkler heads and valve manifold box. For the sprinkler heads’ pop-up mechanism to work, they must stick up slightly out of the ground. Turn the water back on, then run a test cycle of the system. Most systems enable you to adjust the range and force of each sprinkler head. Make the necessary adjustments to ensure that different parts of your lawn are getting even coverage. Program your control box to set a watering schedule suitable for your yard, then sit back enjoy the green, green grass of home!